A.J. had a major relapse on our walk today. The whole incident was pretty ugly, but not entirely because of A.J. A.J. gets a little excited when he sees this. We were walking down the path when deer jumped over the fence on one side and started heading toward the fence on the other side. We stopped to watch, and I handed A.J.’s leash to Greg and got my camera out. When the deer got to the next fence I started filming, thinking I would capture them gracefully jumping the fence. Instead, the four deer turned and started walking along the fence straight towards us. This is where we made a big mistake. I was so intent on staying still, watching the deer and taking pictures that I forgot to pay attention to A.J. He’s been so good lately about not going crazy that I let my guard down completely. Bad idea. 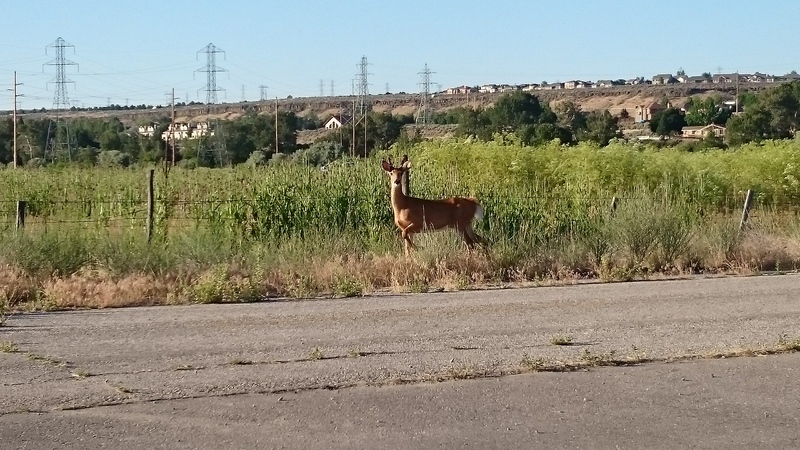 The deer came close, crossed over right in front of us, and stopped. Finally A.J. couldn’t contain himself any longer: he lunged and started barking. Greg had hold of the leash and yanked him back. I saw that A.J. was still ready to go after the deer, so I took hold of the leash and gave him a strong correction. He stopped and turned and looked at me, knowing he was in trouble. At that point we would have been good, but Greg and I messed it all up. I won’t go into the gory details, but let’s just say Greg and I had a slight difference of opinion on how to deal with the situation. I spent months training A.J., maybe Greg should have listened to me. Greg had the leash, maybe I should have let him deal with it and not jumped in. Either way, we both walked off mad at each other and A.J. didn’t actually learn anything. Oops. We continued on our walk. Because that had been such a disaster, when we later saw a duck that was pretending to be injured to lead us away from her chicks A.J. started acting up again. He got a strong correction, then I started working with him to get his little brain settled back down and get him behaving. This time it worked. We had to walk around a little, but after about five minutes of obedience exercises he was doing much better. So we obviously have to stay diligent with A.J., and maybe work on our own teamwork just a bit.